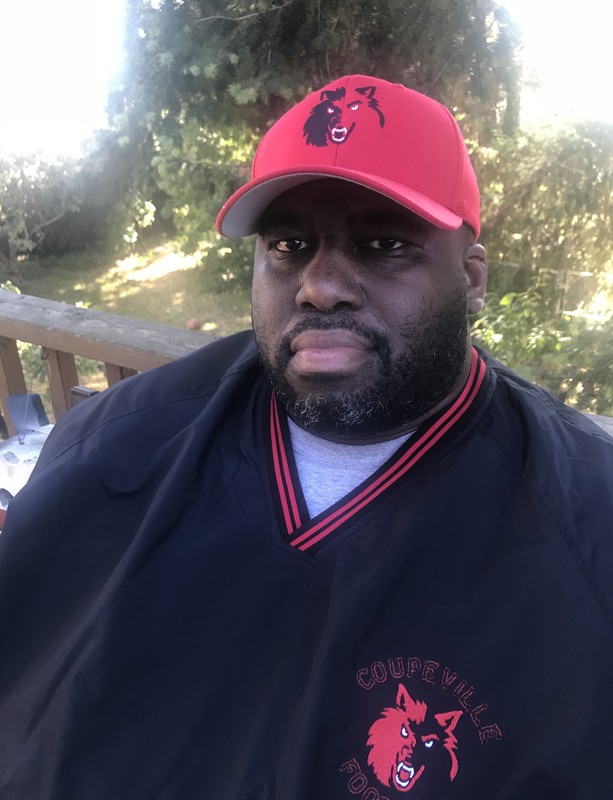 Coupeville High School coaches have banded together to support the family of Wolf head football coach Marcus Carr, and we can all help. Carr’s wife, Deborah, was in a bad car accident coming home from work Mar. 23, and has had to have extensive surgeries. While she is recovering from her injuries, others are stepping up to provide meals for the family of six. CHS cheer coach BreAnna Boon, using the Meal Train web site, has set up an easy way for people to sign up to provide meals, or purchase gift cards which can be used for food. Since they joined Wolf Nation a year ago, the Carr family has had a huge impact on the CHS football program and local student/athletes. Birth of the field of dreams!! You can know the name without knowing all the facts. My family moved to The Rock in 1989 and I made my writing debut in the Whidbey News-Times in early 1990. 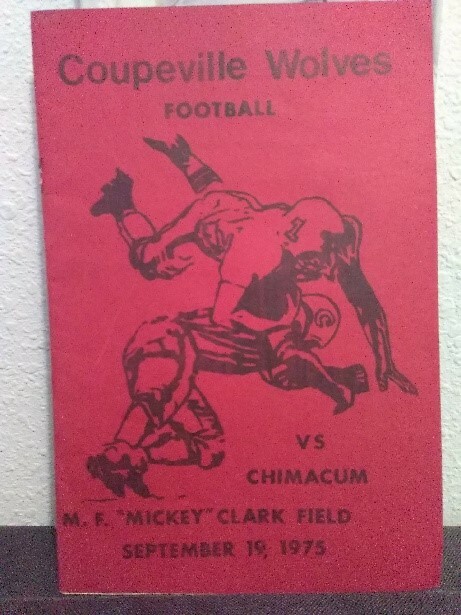 From the first time I stepped foot on Coupeville’s football field (it wasn’t used for soccer back then), I knew it was called Mickey Clark Field. It was only later, though, as I learned more about the history of Cow Town sports, that I got a better image of who the man was, and how he impacted the town and its young athletes. And yet, until this morning, when I stumbled upon a pristine program from 1975 while leafing through memorabilia which Wolf legend Randy Keefe needs to get back at some point, I could not have told you with any certainty when the field debuted. But then boom, nestled inside basketball clippings and programs, there was the football program you see in the photo above. Coupeville football opened the 1975 season with road games at Langley and Concrete, before making its home debut Sept. 19 against Chimacum. It was that night, 43 years back, when the dream became a reality. According to the program, a pre-game flag-raising ceremony was conducted by the honor guard of the Sea Explorer Ship Whidbey, while the band performed under the direction of Leonard Denham. Once the game reached the halftime break, CHS Athletic Director Bob Barker acted as Master of Ceremonies, while John Weber, Chairman of the School Board, and Joanette Wells, President of the Coupeville High Associated Students, gave presentations. Topping things off, the Wolfette Drill/Dance Team, under the direction of Michelle Peel, performed as well. The program paid tribute to a number of groups and individuals who made the field a reality, from the Lion’s Club, Puget Power, Central Electric, Vaughn and Wilson Construction and Chuck Jamison to the school’s vocational shop class. For a period of twenty-five years Mickey coached boy’s softball teams, transporting them up and down the island to their summer league games. He, along with John Syreen, started the little league baseball programs in Coupeville. Mickey coached the high school basketball team for a season when they found themselves without a coach. For a period of ten years he was the official Island County referee. As county referee he officiated all the league football and basketball games for the Island County League teams, consisting of the Coupeville, Langley and Oak Harbor High Schools. Mickey was instrumental in initiating and has directed a program that has probably saved the life of many a community youth – the Lion’s Club Swim Program. For eighteen years, two nights a week, he was busy directing a popular and successful Peewee Junior Basketball league, sponsored by the Lion’s Club. Most recently, Mickey headed the football bleachers building program for the Lion’s Club. For the thousands of hours and sincere interest in our children — this is why Mickey Clark Field. So, now I know, and knowing is half the battle. Big Hurt claims big award!! The Big Hurt is a two-timer. 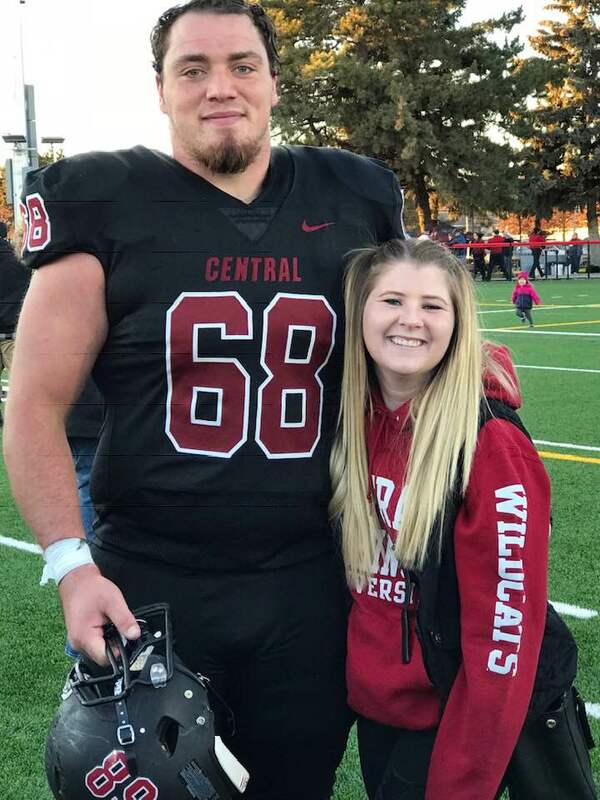 Coupeville High School grad Nick Streubel earned his second-straight First-Team All-Conference nod Wednesday, as he and 19 of his Central Washington University football teammates were honored. The Wildcats, who earned a share of the Great Northwest Athletic Conference regular-season title, but were snubbed when the NCAA DII playoff bracket was revealed, claimed three of the league’s big awards. Quarterback Reilly Hennessey was the Offensive Player of the Year, guard James Moore was the Offensive Lineman of the Year and running back Michael Roots was the Newcomer of the Year. Streubel, a red-shirt junior offensive lineman, was a unanimous pick after playing a major role for one of the most-prolific offenses in DII football. Central, which averaged 47.7 points while going 8-3, rushed for 2,999 yards on the season. The Wildcats averaged 272.64 rushing yards per game, with two different backs rambling for 1,000+ yards. Next up for Streubel is the announcement of the All-Region team, where he will be looking to repeat as a First-Team pick. Wolf grads sparkle on big stage!! Three former Wolves, three different states, all united by the experience of college sports. Coupeville High School grads Kailey Kellner and Makana Stone kicked off new basketball seasons Saturday, in New York and Oregon, respectively. Meanwhile, Nick Streubel rumbled on the gridiron back in Washington state, as he and his team capped their regular season run. D’Youville College used a 22-15 third-quarter surge to claim a win on opening night in Aurora, New York. The Spartans turned a two-point halftime deficit into a five-point advantage, then held on to bounce host Wells 74-69. Kellner, a sophomore, came off the bench to score four points, snag a rebound and dole out an assist in 11 minutes of action. Down by 10 heading into the fourth, Whitman College almost made it all the way back in La Grande, before falling 52-49 to Eastern Oregon. Stone, a junior, topped the Blues with 11 points, 10 rebounds, three blocked shots and three steals. 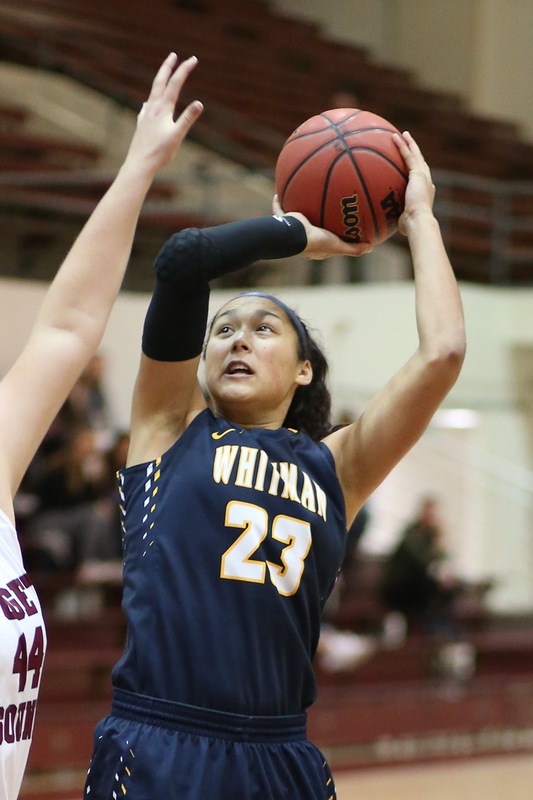 She nailed a pair of key fourth-quarter jumpers to spur Whitman on, with the final one cutting the lead all the way down to 48-45. Unfortunately, that was the last field goal of the night for the Blues, as they could only scrape out four free-throws in the game’s final five minutes. Eastern Oregon, which went 31-2 a season ago, didn’t do much down the stretch, either, but netted a pair of jumpers to keep the margin at three until the final buzzer. Central Washington University couldn’t hold on to a late lead, surrendering the tying and go-ahead touchdowns in the final six minutes in Ellensburg. Nabbing a 42-35 win, visiting Azusa Pacific earned a share of the Great Northwest Athletic Conference title. The squads, which split a pair of games this season, both finished 7-1 in league play, 8-3 overall. It was the second straight league title for CWU, which went 8-0 last season to claim sole ownership of the title banner. Now, Streubel, a red-shirt junior, and his teammates await the reveal of the 28-team NCAA DII football playoff bracket. That goes down Sunday afternoon. It’s a wrap for gridiron gang!! 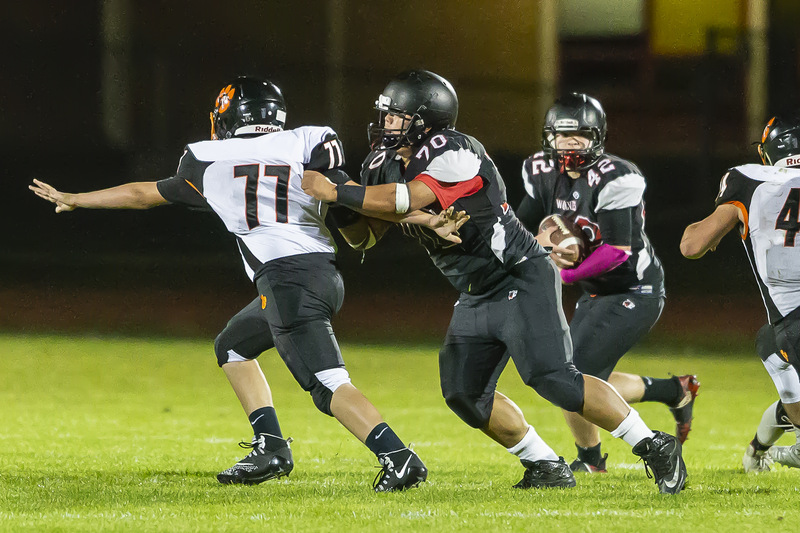 All-Conference lineman Ryan Labrador clears running room for Andrew Martin. The season ended not with a tackle or a screen pass, but with deviled eggs and All-Conference certificates. 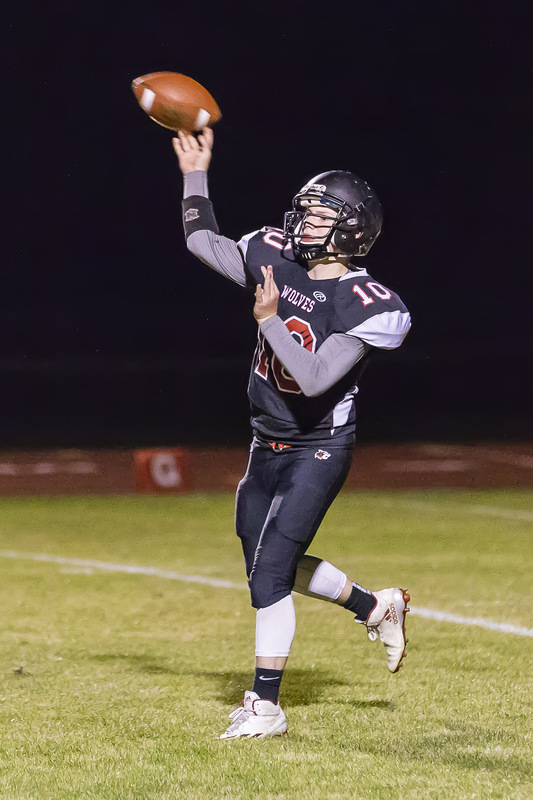 Coupeville High School football brought an end to the gridiron season Thursday with an awards banquet, as the Wolves put a final stamp on the 2018 campaign. First-year head coach Marcus Carr handed letters to 19 players, while also hailing those who played four years of football, and those who were previously honored by the North Sound Conference.